Traditional offices and meeting rooms are giving way to open team and mobile spaces, as well as huddle rooms, all of which present challenges for effective collaboration in geographically distributed organizations. Polycom can help you transform the way you and your teams work and compete more effectively with intuitive collaboration tools that fit with the way your teams work, not the other way around. 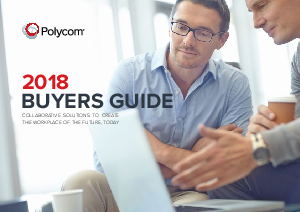 The Polycom 2018 Buyers Guide will help you understand how to apply team collaboration technology to meeting spaces of all sizes.